LesFleurs.ch provides delivery of varied and fresh floral arrangements throughout the world. 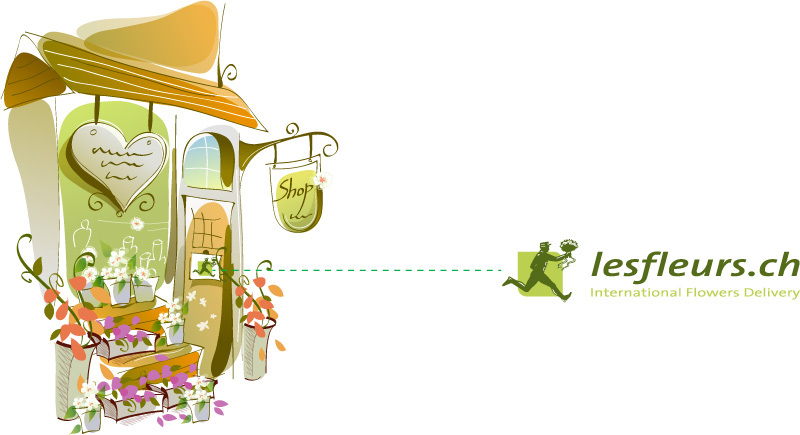 Member of the Teleflor International network which includes over 54,000 florists throughout the whole world, LesFleurs.ch is an innovative player in e-commerce and enjoys a reputation based on 10 years of reliable and quality services. LesFleurs.ch in numbers: annual double digit growth, less than 1% error rate! Do you want to become a LesFleurs.ch partner? Discover our 3 partnership programs right now. Are you a renowned flower shop? Do you deliver? This formula is designed for professional florists desiring to become members of the LesFleurs.ch network in order to send and receive orders to and from the whole world. As a « Partner PREMIUM », you will benefit from a renowned and reliable floral delivery service. As a « Partner PREMIUM », you regularly deliver orders from the network. This allows you to generate new revenue and to gain new customers. With LesFleurs.ch, you set your own delivery rates, your availability and the geographical area in which you wish to make deliveries. A 20% commission on flowers and accessories will be automatically granted to you for every sale. A monthly statement detailing all of your activities will be automatically sent to you on a monthly basis. This helps to decrease your administrative costs. We offer you an efficient tool accessible from the Internet. Handle and manage orders through the easy-to-use interface. Our business model is not based on a ponderous and expensive shareholding system. This enables us to be more efficient and to offer higher profit margins to our partner florists. Additionally, the annual fee for participation in the network is modest and quickly amortized. Thanks to our optional promotional tools (window stickers, catalogues, etc. ), you will be easily recognizable as a LesFleurs.ch reseller and will be able to promote this new service. You are currently connected with a LesFleurs.ch account. Are you sure you want to sign up with this account? Do you already have an account on LesFleurs.ch? All information provided by the user is kept strictly confidential. They shall in no event be sold, rented or simply transmitted to any person, organization or company. Are you a florist, an hotelier, a news vendor, a concierge or services company? This formula is designed for service companies and florists desiring to provide their customers with a national and international flower delivery service. Offer your clients an additional service. Whether you are a florist, an hotelier, a news vendor, a concierge or services company, becoming « Partner EASY » will enable you to offer your customers a new service. Thanks to you, they will be able to send flowers throughout the world with our network of professional independent florists. A Swiss floral delivery company with 10 years of successful business and renowned for its reliability and innovation. LesFleurs.ch in numbers: annual double digit growth, less than 1% error rate! Manage and monitor all of your orders and receive delivery confirmations through our easy-to-use interface accessible from the Internet. No hidden fees and no obligations, you are free to end this partnership at any time. You will receive a monthly report detailing all the transactions which have been made with your account. A 20% commission on flowers and accessories will be automatically granted to you for every sale. Are you an online florist, an association or a popular news site? Promote your website! 8% commission! This formula is designed for companies or individuals who manage a website. The member receives a 8% commission on each sale recorded from their website. In exchange, the member places an affiliate link, redirecting users to LesFleurs.ch, on their website. You will receive a 8% commission on flowers and accessories on each sale coming from your affiliate link. You can check your sales and collect your commissions at any time by connecting to your affiliate account. Flowers are enjoyed all year round and for all occasions and generate a lot of goodwill. They are now able to offer fresh floral arrangements throughout the whole world. What's more, they can do it directly from your website. Choose the affiliate link most suited to your communication strategy: banners, clickable links, white label, the choice is yours! Our interface enables you to visualize the affiliate links which can be installed on your site in a couple of minutes. No hidden fees and no obligations. You are free to end this partnership at any time.